Because the corporate goal is to obtain the highest profit possible, not social welfare, public health or environmental sustainability, business interests often give little or no consideration to the effects of corporate practices on indigenous peoples. Thus, the estimated 257 to 370 million indigenous peoples in about 5,000 communities in 70 countries, speaking 5,000 of the 6,000 existing languages, often experience severe detrimental consequences from commercial activity. The effects of extractive industries such as mining, agricultural crops and timber, and the theft of intellectual property rights illustrate some of those consequences. Forests for the logging industry; oil and gas for exploration and drilling industries; gold and other minerals for mining companies and agriculture; use of the land for mono crop farming such as tobacco, palm oil, coffee, rubber; dams on indigenous land to create lakes or use of rivers to produce electrical energy; and nature reserves established in areas where they displace the indigenous peoples living there. These extractions are reminiscent of early European appropriation of the Americas under the concept of “terra nulius” that is, land not belonging to anyone, and therefore available for the taking, even though millions of indigenous peoples had inhabited an area for thousands of years prior to European explorations. 1. The industrial operations displace indigenous people from their ancestral homes and land which have been integral to their spiritual, physical, mental and emotional life, requiring indigenous people to move to other remote but unfamiliar areas, or to migrate to the unsanitary, unhealthful fringes of urban areas with unlikely means of earning a decent livelihood. As a result the indigenous people experience social disorganization in their relationships to each other, and disruption of their relations with other indigenous group. They are forced to interact in new and unfamiliar settings with unfamiliar types of people, practices and ways of behavior. 2. This displacement, dispersion and migration leads to loss of their language and culture. 3. Their ancestral land may be confiscated with no or little financial remuneration for the land or for the extracted substance. 4. With loss of land, they lose their traditional livelihood, subsistence farming or place for gathering food and traditional medicinal plants. 5. Their sacred land or water be polluted by the extractive operations. 6. Contacts with extractive industry workers may expose the indigenous peoples to new diseases that they then transmit to their families, neighbors and other groups of indigenous peoples. Napolitano described a 20 year history of an indigenous peoples’ contact with extractive industries within a territorial reserve the government established for four groups of indigenous people in an isolated area of the Amazon River. Logging of mahogany and cedar, and oil operations in or near the area during the 1970s and 1980s led to some violence against the industry operations, some displacement of one indigenous group, and interethnic clashes between groups. In about 2001, work began on a gas field concession granted by the Peruvian government, 75 percent of which was within the territorial reserve. Loggers working in an area of the Amazon encountered members of the Nahua indigenous group. Some of the Nahua went down river and interacted with the loggers. Upon their return up river, epidemics, including pneumonia, complicated by parasites and malaria, began among the Nahua. The people were too sick to hunt, fish or harvest. There were too many dead to bury and the bodies were left on the ground. The indigenous people became dependent upon the loggers and missionaries for sustenance. Logging expanded and virtually took over the area of the indigenous people. Many of the indigenous people moved to a town but later became dissatisfied and returned to their communities. Some also worked in the logging industry. In the area occupied by another group, the Nati, a mission and a school were established where respiratory and gastrointestinal infections were brought from down river, leading to many deaths. Epidemics of respiratory and diarrheal disease also began in company work camps where some indigenous workers also lived. Indigenous peoples’ movements between camps and their home communities facilitated the spread of disease, including scabies outbreaks from donations of clothing from worker camps to the indigenous peoples. After extractive industries entered the area, infant mortality was high and there were fewer pregnancies, due in part to changes in traditional gender roles of food gathering and cultivation and the growth of industry jobs that led to malnutrition and thereby comprised resistance. A similar process sometimes occurs with indigenous food crop seeds that indigenous people have produced through selective genetic breeding research over centuries. The corporation sells those patented seeds to farmers and prohibits the farmers from saving seeds from their own crops for the next year, and requires them to buy company seeds. In some areas of India where this has occurred, the suicides of many farmers has been attributed to the poverty that resulted from this process. There is commercial interest in mapping the genomes of indigenous peoples in order to develop new medications and other treatments. Indigenous people have had their blood specimens taken and used for this purpose without their permission, and without any compensation for the products developed from the research on their tissue. Some indigenous cultures have beliefs about extracting bodily parts, contact with human tissue and specific practices for discarding tissue that may not be respected by those who collect the specimens. The symbols and designs of indigenous peoples have been used in commercial products without their permission and without financial compensation. Without a history of private ownership, patents and copyright of art is a new concept to indigenous peoples, requiring them to learn about and develop new procedures and practices. 3. In 2007 the “Declaration of the Rights of Indigenous Peoples” was passed (but not by all countries). Article 29 is the right to control, develop and protect their sciences, technologies and cultural manifestations. – Conduct and implement environmental, social, cultural, and human rights impact assessments to the highest international standards ensuring independent review and participation of indigenous peoples. The public health profession can take a variety of actions to address the effects of commerce on the health of indigenous peoples. 4. Create specific official organizational policies to support indigenous rights and health in policy processes and commercial agreements. 1. Mander, J. & Tauli-Corpuz, V. Paradigm wars: Indigenous peoples’ resistance to globalization. San Francisco: Sierra Club Books, 2006. 2. Napolitano, D.A. Towards understanding the health vulnerability of indigenous peoples living in voluntary isolation in the Amazon rainforest: Experiences from the Kugapakori Nahua reserve, Peru. EcoHealth 2007; 4, 515-531. 3. Gheorghiu, V.A. Sailing The seas of treaties: Biopiracy in the wake of the International Treaty on Plant Genetic Resources for Food and Agriculture. Fourth World Journal, 2007; 7 (2), 1-39. 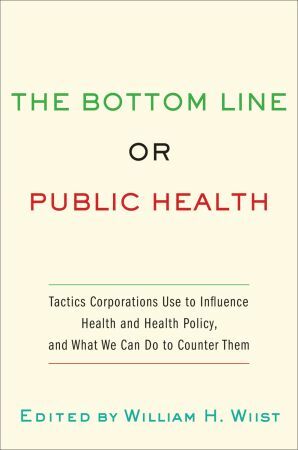 William H. Wiist is a Professor in the Department of Health Sciences at Northern Arizona University and the editor of The Bottom Line or Public Health: Tactics Corporations Use to Influence Health and Health Policy, and What We Can Do to Counter Them. This post first appeared on Corporations and Health Watch.